My primary inspiration for this series came from reading a biography of George Muller, who opened an orphanage in Bristol, England, in the 1840s. He never solicited donations or money; he was a man of fervent prayer and believed God would always provide. In time his work grew, along with the buildings, until by the end of the century the orphanage was caring for over 2,000 children! Supported only by faith and prayer, they provided a tangible example of God’s faithfulness to answer prayer and care for His people. I began to wonder what a person would be like who had been raised in this atmosphere of always trusting God and looking to Him to meet every need. When they went out into the world as adults, how would they respond to life’s challenges? That’s when the idea for this series was born. It follows three sisters who were raised in Muller’s orphanage. They each end up coming to London to begin a new life, and each will find their trust in God tested and strengthened by the obstacles they must overcome. My goal for research is to be able to bring the world of my stories to life for the reader in a vivid way. So I pursue lots of different avenues, including unconventional methods that might not initially come to mind when one thinks of research. First, of course, is the reading—but I don’t confine myself to books written about the era. I utilize many primary sources, such as the books, diaries, and newspapers written during the time period I am researching. Many of these are digitized and easy to find online. I have delved into primary sources on all sorts of subjects, from travel guides to court transcripts to home medicine. But research is more than reading! I make every effort to incorporate all of the five senses when doing research. Because The Captain’s Daughter is set backstage at the original production of the comic operetta HMS Pinafore, I spent an afternoon backstage at a local production of that very show. I observed the singers’ vocal warmups, the handling of props and scene changes, and experienced firsthand what it was like to watch a performance from backstage—something Rosalyn does many times in the book. This gave me the flavor of theater life and generated lots of ideas for the story. I researched fiddle playing too, since Nate, the hero of the book, plays that instrument. I watched online videos to hear the music as well as to watch the performer’s body movements and facial expressions. I even found a violinist who was willing to spend an hour with me, answering specific questions and allowing me to try out the instrument for myself. I was also fortunate enough to go to Bristol and see the buildings that housed George Muller’s orphanage, where Rosalyn and her sisters were raised. At the Muller Charitable Trust, I spent several hours thumbing through extensive photo albums and chatting with the overseer of the museum about what everyday life at the orphanage was like. These are just a few of the ways that I was able to use research in order to draw closer to my characters and better understand the world they inhabited. When I was twelve years old, my parents took me to see a Gilbert and Sullivan operetta, and I have been a big fan ever since. The shows are funny and the music is gorgeous, with many irresistibly catchy songs. They poked gentle fun at English society and the customs of their time (the late 1800s), and yet they are still fresh and popular today. A few years ago, I saw a movie called Topsy-Turvy, which spurred my interest to learn more about the lives of Gilbert and Sullivan and how their operettas came to be written and produced. As I read their biographies and learned more about Victorian theater, I knew this was something I wanted to write about. In The Captain’s Daughter, I was able to incorporate two of Gilbert and Sullivan’s most popular operettas, HMS Pinafore and The Pirates of Penzance (my personal favorite). I hope it will give my readers a taste of how delightful these shows are and spur them to see a production someday. Why is the series called “London Beginnings”? A theme that runs through my books is that with God there can always be a new beginning. Mistakes or events in the past don’t have to prevent us from forging a new future. This series follows the lives of three sisters who each come to London independently in order to find a new life. Although events don’t take them exactly in the direction they’d planned, each sister finds a new beginning that is even more satisfying than she’d imagined. The series explores many fascinating aspects of London life in the 1880s, including the theater, the burgeoning art scene, and expanding opportunities for women. 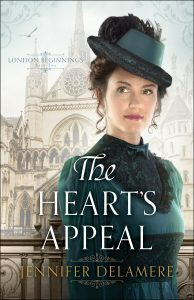 The next book in the series, The Heart’s Appeal, focuses on Julia Bernay and her goal of becoming a licensed physician—a career that had only just become available for women at that time. 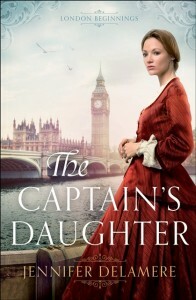 I hope my readers will enjoy this foray into Victorian London!